It is, unfortunately, the dramatic changes in Arctic sea ice conditions in recent years that have made this trip possible. On the time of Roald Amundsen it took five to six years to complete the same distance, due to the extremely difficult and demanding ice conditions. Now we have proven that it is possible to make the voyage in a 31-foot fibreglass sailing boat, equipped with a 10 horsepower outboard motor for emergencies. This shows how dramatic and how fast these changes are happening. The changes that we are witnessing will influence climate on a global scale, in addition to the whole range of animal life in the Arctic — especially seals and polar bears, whose lives are dependent on the sea ice. Congratulations to both teams for their remarkable achievement. 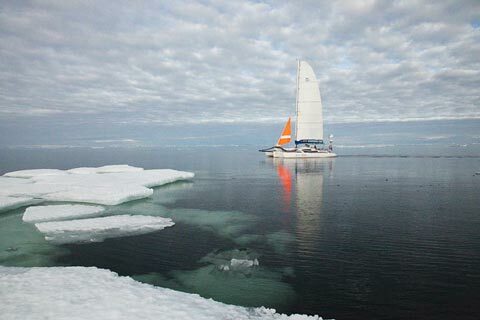 Given that the first circumnavigation by a sailing vessel was made by the French yacht Vagabond over two seasons as recently as 2002-2003, it’s clear that the pace of change in the Arctic is not slackening. Reflecting that, the Arctic Forum — a meeting of countries with claims to Arctic territory — is currently underway in Moscow. The Independent reports that the mood of the meeting is “conciliatory”, but the pressure to establish territory is growing as the rush to exploit oil, gas and mineral resources intensifies (see BBC for more). “I hate to say it but I think we are committed to a four- to six-degree warmer Arctic,” Serreze said. That would be catastrophic for human civilisation, experts agree. In other words, we have very good reasons to believe that settling for a 2ºC target would be to acquiesce in a global disaster. We can only hope for two things: that the climate commitment (the inevitable warming “in the pipeline”) does not push the Arctic into a huge release of methane, and that the world’s leaders wake up to the real scale and urgency of the problem. For all our sakes.